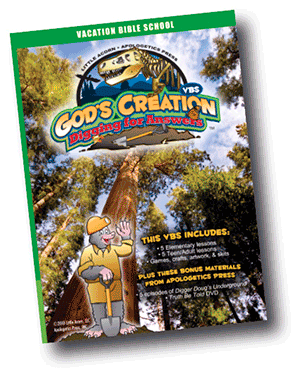 Apologetics Press - New Creation VBS! Imagine young people coming to Vacation Bible School and encountering an eight-foot-long Triceratops. Visualize walking into a classroom that has been transformed into an environment in which dinosaurs and humans interact. Envision kids sitting in a room surrounded by stars and planets glistening on the wall. Is such a VBS possible? For years, we at Apologetics Press have been receiving requests for a Christian Evidences Vacation Bible School curriculum. We are most pleased to report: the request has finally been realized. In conjunction with our good friends at Little Acorn (an organization that possesses considerable expertise in the development of VBS curricula), Apologetics Press has just released a brand new Creation VBS in plenty of time for the upcoming summer VBS programs across the country. This new tool has everything you would expect an A.P. product to have. The VBS is designed for a five-day series—but may be easily adapted to four days. All six days of Creation are covered, plus two lessons on dinosaurs and the Flood. Our VBS curriculum is packed with informative lessons, PowerPoint slides, creative craft and game ideas, skit scripts, decoration ideas and templates, and more. It is comprehensive, easy to use, comparatively inexpensive, and above all, biblically accurate. 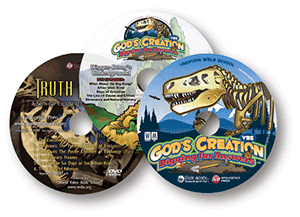 It even includes five episodes of the Digger Doug’s Underground children’s television program, as well as the Truth Be Told DVD that contains six lessons on the myth of evolution. To learn more about this exciting new VBS, see the center spread of this issue of R&R, or visit our Web site at ApologeticsPress.org/vbs. A sample CD is available for those who wish to know more about the program before ordering. May I urge you to pass this information on to your elders and VBS directors?